The name Chemtex simply depicts 'Technology in Chemistry'. Chemtex, an advanced technology driven company has been in the core sector of speciality chemicals since 1970. The brand enjoys a considerable market share in global speciality chemicals industry for the past 46 years. Chemtex Speciality Limited is a public limited organization registered under Company's Act 1956. It is an MSME registered company for manufacturing of Speciality Chemicals. The quality management system is certified by ISO 9001:2008 certification. The financial and performance capability of the company has been rated by CRISIL (A Standard & Poor’s Co.) which certifies high ability by awarding SE-2B rating. Chemtex chemicals contribute substantially to the priority areas of energy conservation and environment protection and has been certified with NS-EN ISO 14001:2004 (EMS) certification. The company is backed by about a gross of qualified professionals having a collective experience of over a hundred decades in the industry. 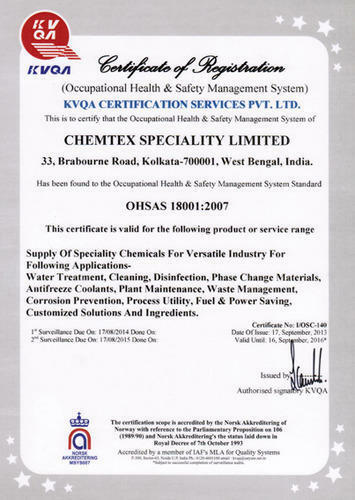 Chemtex is certified under the Occupational Health and Safety Management system by OHSAS 18001:2007 certification, ensuring the industry's best work environment. Chemtex follows Good Manufacturing Practice (GMP) as per World Health Organization standards and is certified with WHO-GMP Certificate. Chemtex is chosen for its integrity and observance for high quality standards with commitment to customer value. The company has served over 22000 clients worldwide so far and still counting. The company has been awarded with the Best Growing Business Award by WBBA in 2010 and 2012 and by ABID in 2013 for Best Place to Work. Chemtex has wide spread applications and provide service to various industries, amongst which the major being Agro, Food & Beverage, Automobile, Dairy, Iron & Steel, Institution, Paper, Pharma, Power and Textile. As such, with the wide range of products offered by the company it may not be wrong to say that there is something to offer for every industry. The main product line of Chemtex is divided majorly into four verticals, viz., Water treatment chemicals, Cleaning and Hygiene Chemicals, Heat Transfer Fluids and Performance Chemicals. Our team is our backbone which is continuously supporting us in serving our clients with ultimate perfection. It’s owing to the dedication and hard working spirit of our employees that we have succeeded to gain a respectable position in the industry. Our professionals are appointed on the basis of their industrial experience and skills for carrying our all the organizational activities in a stream lined manner. Apart from this, we are organizing regular training sessions for our employees to keep them updated with all sorts of developments taking place in the market. We are a quality-focused player of the market, adapting strict parameters to check our products to be in compliance with international quality standards. We procure highest grade raw materials from certified vendors and process them into finished goods by scanning each stage for quality returns. Our quality inspectors underline parameters like durability, functionality, installation, maintenance and operation to check our range of products for superior quality, prior to their dispatch in market. Quality is our tool of client retention and we aim to maintain constant levels of it in every product.